Place chicken and liquid from cans into dutch oven. Break up chicken with a fork. Add salt, condensed soup, enchilada sauce, corn, olives, onions and water to make a sauce. Heat to Simmer at 225 degrees for 15 minutes, stirring occasionally. 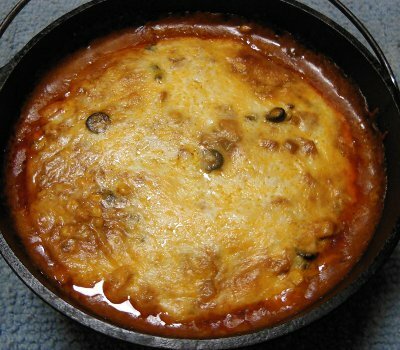 Remove about 3/4 of the sauce into bowl or pot, leaving a layer in the dutch oven. Sprinkle a layer of cheese over mixture remaining in dutch oven. Lay two tortillas on cheese. Spread 1/4 of the sauce from the bowl over the tortillas, then sprinkle cheese, then 2 more tortillas. Repeat sauce, cheese and tortillas until tortillas are gone. End with sauce and cheese on top. Put lid on dutch oven and Bake at 350 degrees for 30 minutes. Let me know how you enjoyed your Chicken Enchilada Pie! @Jim - It's supposed to be 'soupy' like a chicken pot pie rather than firm like lasagna. But, experimenting is how recipes improve!